Under the patronage of Egypt’s Minister of Agriculture and Land Reclamation Dr. Abdel Moneim El-Banna, WorldFish and the Central Laboratory for Aquaculture Research (CLAR), will host Cairo’s First International Scientific Conference and Exhibition on "Sustainable Development of Aquaculture" from 20 to 22 November 2017. The event held under the auspices of the CGIAR Research Program on Fish Agri-Food Systems (FISH) is sponsored by the Swiss-funded Sustainable Transformation of the Market System in the Egyptian Aquaculture Sector (STREAMS) project - as well as a number of private sector sponsors including Skretting and Aller Aqua. 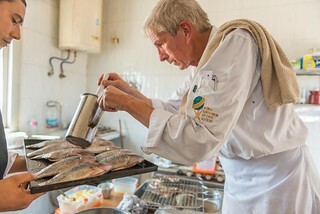 The conference in Cairo starting today will bring together about 400 policy-makers, scientists, economists, academics, service providers, fish farmers and veterinarians, providing an opportunity for diverse stakeholders across the aquaculture sector in Egypt, Africa and around the world to exchange expertise. 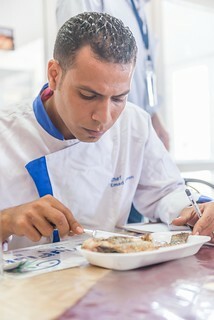 “The Central Laboratory for Aquaculture Research, in partnership with WorldFish, is keen to communicate research outcomes to the concerned parties, decision-makers and policy-makers, and pursue an ongoing dialogue with fish farmers, producers and feeds companies to guide the continuous progress of fisheries and aquaculture in Egypt and worldwide,” said CLAR Director Dr. Ayman Ammar. Recent challenges facing the aquaculture sector in Egypt, Africa, the Middle East and worldwide will be addressed including disease prevention, the role of the aquaculture sector in achieving food and nutrition security, the role of genetic improvement in the development of the sector and the growing role played by aquaculture in providing livelihood opportunities for the poor in developing countries. “The key in unlocking the potential for fisheries and aquaculture to feed Africa and the world lies in embracing new technologies that foster sustainable increase in productivity. We at WorldFish have focused our research on delivering a genetically improved and bio-secure Abbassa Nile tilapia strain and on training farmers and other stakeholders on the benefits of Best Management Practices. It is an opportunity to share and learn from each other’s experiences,” said WorldFish Country Director for Egypt and Nigeria Dr. Harrison Charo Karisa. The three-year STREAMS project, launched in February 2016, aims to benefit 44,750 people directly and an estimated 3.9 million people indirectly. It is assisting fish farmers, fish traders and retailers across seven Egyptian governorates: Kafr El Sheikh, Beheira, Sharkia, Fayoum, Port Said, Minya and Beni Suef. The funding allocated for this project is 2 million Swiss Francs. Keynote speakers at the conference will share their experience and discuss the latest developments in the sector, among them Dr. Mohammed Faisal, University of Michigan, USA; Dr. Malcolm Beveridge, Food and Agriculture Organization (FAO); Dr. John Benzie and Dr. Benoy Kumar Barman from WorldFish. The 35 accepted research papers presented at the conference - will be published in a special edition of the International Abbassa Fish Farming Journal and the Egyptian Fish Farming Magazine as well as on the conference website (www.sustainaqua-eg.com). The conference organizers will also offer a space for exhibitors to provide innovations, products and services related to the development of the aquaculture and fisheries sector. Pursuing a research agenda through a network of multistakeholder partners, The CGIAR Research Program on Fish Agri-Food Systems (FISH) enhances the contributions of fisheries and aquaculture to reducing poverty and improving food security and nutrition. FISH brings together a unique set of multi-stakeholder partnerships to harness emerging science in aquaculture and fisheries to deliver development outcomes at scale. FISH is led by WorldFish, together with the Australian Research Council Centre of Excellence in Coral Reef Studies at James Cook University, Australia; the International Water Management Institute; Natural Resources Institute at the University of Greenwich (NRI), England and Wageningen University, Netherlands. In regional contexts, the program partners closely with governments, NGOs, the private sector and research organizations to influence national, regional and global policy and development practice.